HP Mouse - End of the World Production, LLC. The one and only tool we will be using is a trusty "4 in 1" screw driver. 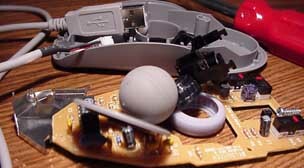 The first step in breaking (or cleaning) a ball-based mouse is to take out the ball. 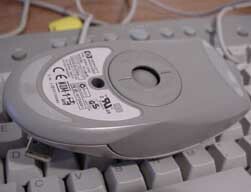 That is usually accomplished by unscrewing the ball holder plastic thingy under the mouse. 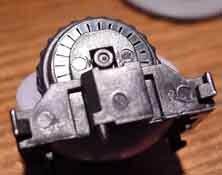 If we were interested in cleaning the mouse, we would wash the ball, etc., and then would close it up again. Unfortunately for the mouse, we don't want to clean it. We want to destroy it. 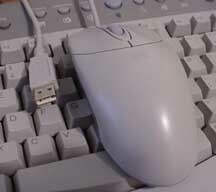 Fact: A ball mouse is actually an optical mouse. 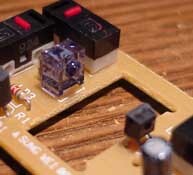 It is also based on LEDs. 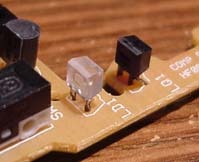 There are light-emitting diodes and light detecting diodes called photodiodes. These are set side by side, separated by a wheel with slits. 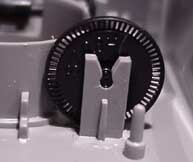 When the wheel moves, the diodes detect these slits. There are 2 pairs of these, one for X-axis, and one for Y-axis. 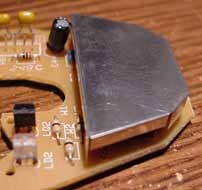 Lets turn out attention towards the back of the mouse, where it seems there is a heat sink or something that's covering some chip. 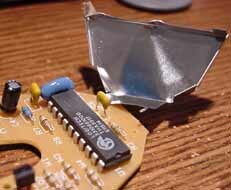 The chip it is covering is a Logitech microcontroller. This is the brain of the mouse. This is essentially a Logitech mouse with an HP cover on it.